HARTLAND, Wis., (November 8, 2013) — Dorner’s new 2200 Series SmartFlex conveyor system does many things very well – and product transfers is one of them. The 2200 Series SmartFlex flexible chain conveyor platform excels at small-part handling, thanks to its power transfer features that smoothly transfers parts as small as 3” diameter on and off the conveyor for improved performance. The power transfer can be integrated into the conveyor in two different designs: drive tail or idler end. The direction in which product is moving on the conveyor dictates which power transfer to use: the drive tail is used when the product is flowing off the conveyor, and the idler end is used when the product is flowing onto the conveyor. Both options are slave-driven from the conveyor’s motor. The 2200 Series SmartFlex is a high-performance, flexible, modular chain conveyor that can be configured to wrap around machinery and equipment in the packaging, food, medical and assembly industries. What makes the 2200 Series SmartFlex different from competing models is that Dorner has removed all the guesswork commonly associated with specifying and ordering a flexible chain conveyor. Dorner provides all the engineering tools and finished assemblies, enabling customers to build complete 2200 Series SmartFlex conveyor assemblies to their exact layout dimensions and view it in 3D within minutes. 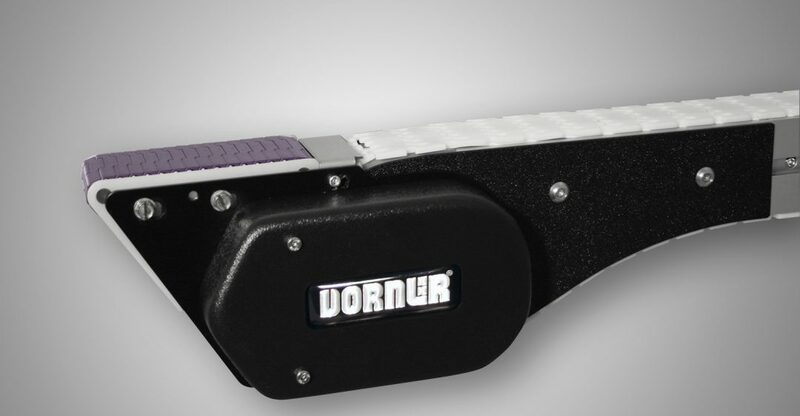 For more information on the 2200 SmartFlex conveyor platform, visit www.dornerconveyors.com.